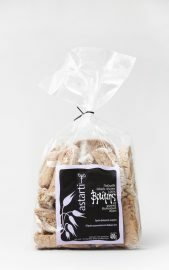 Astarti Organic 100% Oats Dry Bread-Rusk (paximadi), double baked. By following traditional practices of Kytherian bakeries, we have created at our local Karava Bakery, this unique paximadi Astarti made of oatmeal. 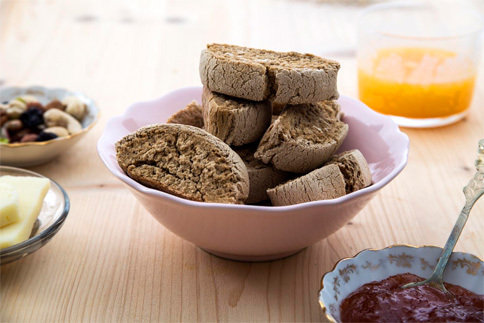 Small Greek farms provide the certified organic wholemeal oat flour which together with unrefined natural sea salt collected from the rocks of Kythera gives us this fine product the value and origin of which is guaranteed by Astarti. *Our nutritionist stresses the importance of a varied and balanced diet as well as a healthy lifestyle. We recommend you enjoy them whole or crumbled into salads. Alternatively, you can use them in the same way as cereal together with milk for a healthy breakfast. Instead of a biscuit to accompany your morning tea or coffee, or for a late evening snack with a chunk of cheese, crunch into one of our oatmeal paximadia. No guilt feelings attached! Certainly a nutritious and healthy snack for children all in two bites. • Normal paximadi – small size (approximately 20g per pcs. ), Plastic (PP) packaging of 400g. Oats, with the scientific name «Avena sativa», is a hardy cereal that can be grown even in difficult terrain where other crops cannot thrive. Indeed it grows best in colder climates with abundant rainfall –conditions normally unsuitable for cultivation of most grains. This explains why it is so popular in Scotland and Ireland! Following the harvest and during processing the oats are hulled and cleaned, but the process does not remove the bran and germ, resulting in a concentrated source of fiber and many other nutrients. Oats are an excellent source of phosphorus and copper, biotin, vitamin B1, magnesium, manganese, chromium, zinc, and protein. Natural Sea salt: Ιts beneficial secrets Natural unrefined sea salt contains besides sodium, 91 different minerals in perfect proportion. This is an important source of essential minerals and trace elements that our bodies need to function properly. The use of unrefined natural sea salt, from the rockpools of Kythera, along with many other raw foods in the daily diet provide the means for an excellent physical and mental health. Health Benefits: Dozens of studies have documented the many health benefits of consuming oats. The consumption of oats helps to reduce LDL “bad” cholesterol and may help reduce risk of heart diseases. Because fiber swells in the digestive tract, it also encourages satiety after a meal and may aid in weight-loss or maintenance efforts as well as regulating hunger related hormones. Due to the significant content of beta-glucan it boosts the immune system and its activity against virus, bacterial, fungal and other infections. Helps reduce the risk for type 2 diabetes, since the abundant presence of soluble phyto fiber promotes healthy blood sugar control. Helps in proper functioning of the intestine, having a mild laxative effect, without the side effects associated with the use of laxatives. The need for laxatives will also be lessened. It is rich in beta-glucan, a type of starch which stimulates the immune system. This can help reduce the risk of certain cancers. Early introduction of oats in children’s diets can help reduce the risk of asthma. It does not contain gluten and thus can be used in a gluten-free diet, adding nutritional value. Oats is higher in protein and “good” fats and lower in carbohydrates than most whole grains. Contains more than 20 unique polyphenols, called avenanthramides, which have strong anti-oxidative, anti-inflammatory action.